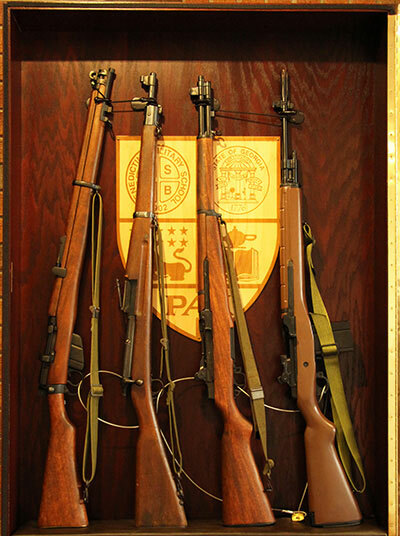 Welcome to Alumni Hall of Benedictine Military School. The school was founded by the Benedictine Monks of Belmont Abby under the leadership of Bishop Leo Haid, O.S.B. who was the Abbot. 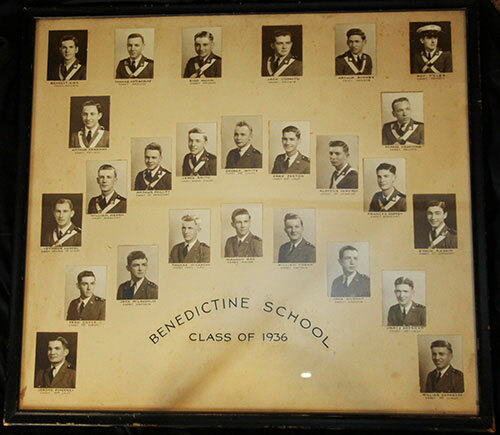 The original name of the school was Benedictine College, and people soon referred to the school as BC. 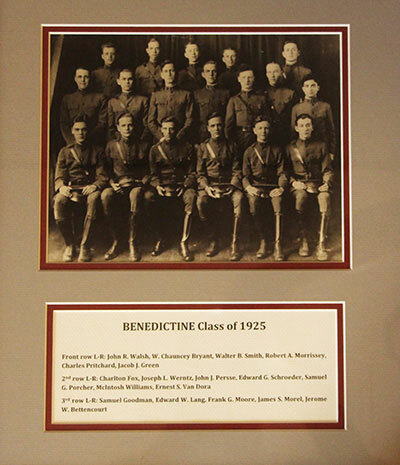 In 1921, the name of the school was changed to Benedictine School; and in 1937, the name became Benedictine Military School. 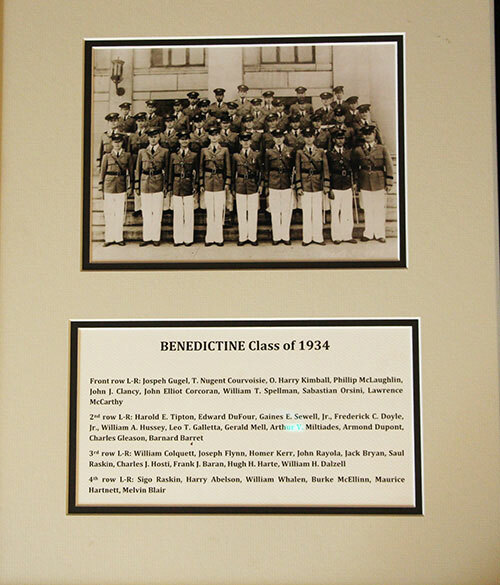 On the walls of Alumni Hall, you will find the names of every cadet who graduated from Benedictine along with class photos for each year. On the left side as you enter Alumni hall, there is a photo of the first school building of Benedictine College which was located at Habersham St. and 32nd. St. There were 21 cadets in the first year, all of which were freshman. The first cadet to register for BC in 1902 was Thomas Furlong. 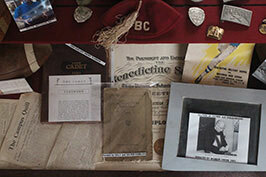 In the photo of the Class of 1925 is Cadet Eddie Lang who wrote the BC fight song. Lang adapted the song from the Washington & Lee swing which was written in 1910. In the 1920’s over fifty schools adapted their school song from the Washington & Lee Swing including the University of Alabama & Tulane University. The BC fight song is sung at sporting and other school events, and it is considered the school song. 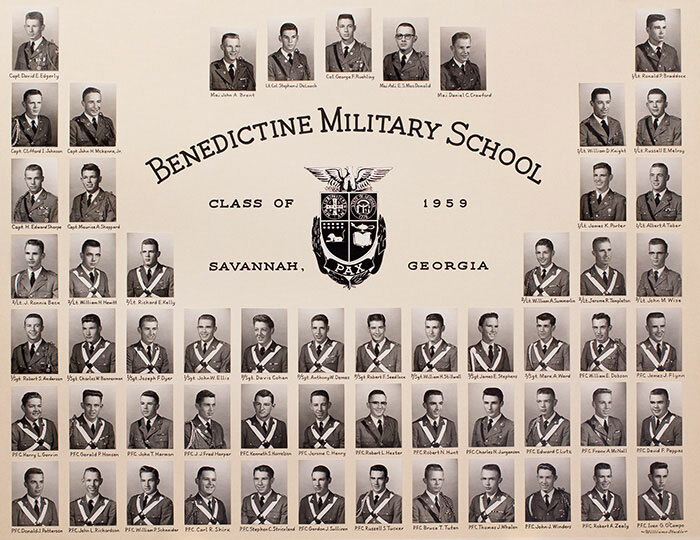 There is a trophy case below class photos of the 1930’s that contains trophies for which Benedictine athletic teams won Georgia State Championships. The first was the 1961 GHAA Baseball Championship under Head Coach Charlie Moore. BC also won the 2014 State AA Baseball Championship under Head Coach Kevin Farmer. Charlie Moore and Kevin Farmer are alumni of Benedictine. Other State Championships were for golf 1983, 1985 & 1993 and for lacrosse 2012 & 2013. Just above the trophy case is the class photo for the class of 1936. A member of that class was Aloysius “Al” Handiboe whose father, Aloysius Handiboe, Sr. wrote the song “It’s St. Patrick’s Day in Savannah” which is sung during events for the Savannah St. Patrick’s Day Parade including the investiture of the Grand Marshal. Al Handiboe, Jr. was Grand Marshal of the 1973 St. Patrick’s Day parade. 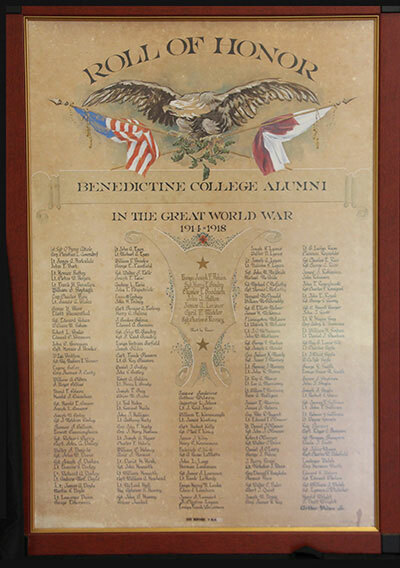 There have been 52 Benedictine graduates who became Grand Marshals. The first was Dr. Michael J. Egan, BC Class of 1909. The Benedictine Cadets have marched in every St Patrick’s Day Parade since the first year of the school. The photo of James M. Cates, Jr. is included in the composite of the Class of 1945. He left BC early to serve in the military during Word War ll; and years later, called from his home in Iceland to request his photo be included with his classmates. His photo shows him in his World War ll flight jacket. Cadets have distinguished themselves throughout the United States and the world. They still remember their camaraderie with their BC classmates as special times in their lives. 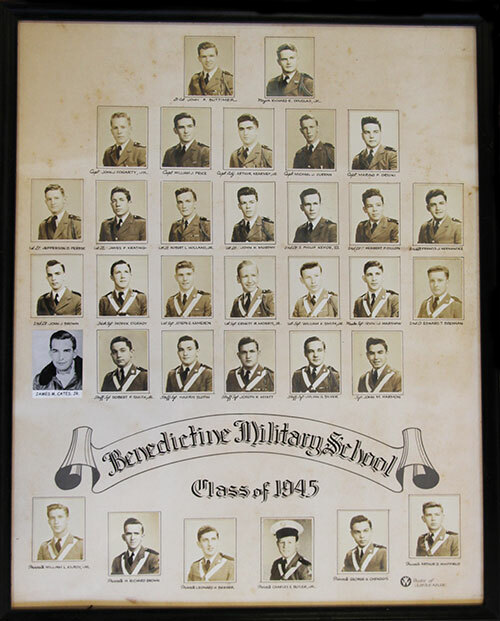 In the photo of the Class of 1947, you will see a photo of Reid Broderick. Reid received more honors while a Cadet at Benedictine than any cadet. He was Commander of the Corps ofCadets, Class President, Class Valedictorian, Recipient of the Fr. Raphael Arthur Cup as the Ideal Senior Cadet, Best Drilled Cadet Medal, Outstanding Freshman Award, and medals for religion, chemistry and oratory. He was editor of the Campus Quill school paper, captain of the varsity tennis team and member of the Glee Club. Reid became a popular and much beloved physician in Savannah. The Class of 1947 includes seven graduates in United States Naval uniforms who left BC early to serve in the Navy during World War ll. 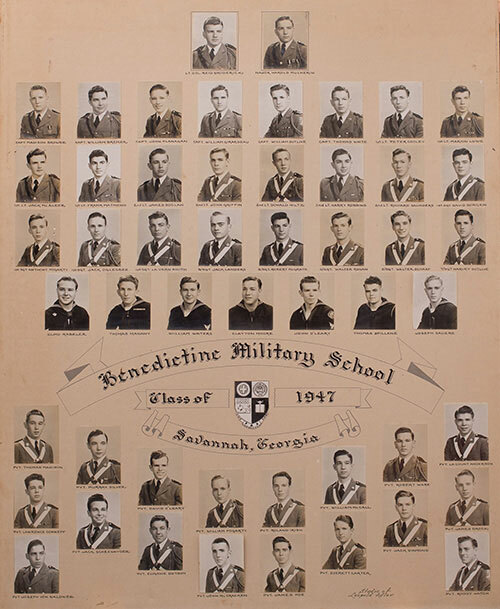 When they returned to Savannah, the school included them in the Class of 1947. Half way down Alumni Hall on the left side, there are photos of the members of the Benedictine Class of 1959. This class has four members inducted into the Savannah Area Sports Hall of Fame including Major League Baseball player Ken “Hawk” Harrelson. Harrelson was the Sporting News American league Player of the Year in 1968, and he played in the World Series for the Boston Red Sox. He was also a professional golfer and played in The British Open among other PGA tournaments. The other inductees are Jerry Templeton, Ronnie Braddock and David Edgerly. 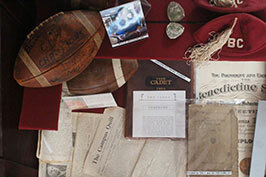 At the end of Alumni Hall there are two display cases containing BC memorabilia including the game balls from the 1958 and 1959 Thanksgiving Day football games against Savannah High, a piece of legendary teacher Fr. 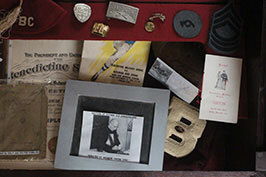 Al’s chalk board, a 1917 Benedictine College Catalogue, old football programs and other items. There is also the sign from the Bull Street campus that was erected in 1921 when the name was changed from Benedictine College to Benedictine School. 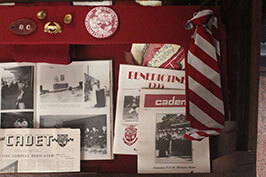 It was recovered and donated by Tim Ansley of the BC Class of 1964, the first class from the “New School”. 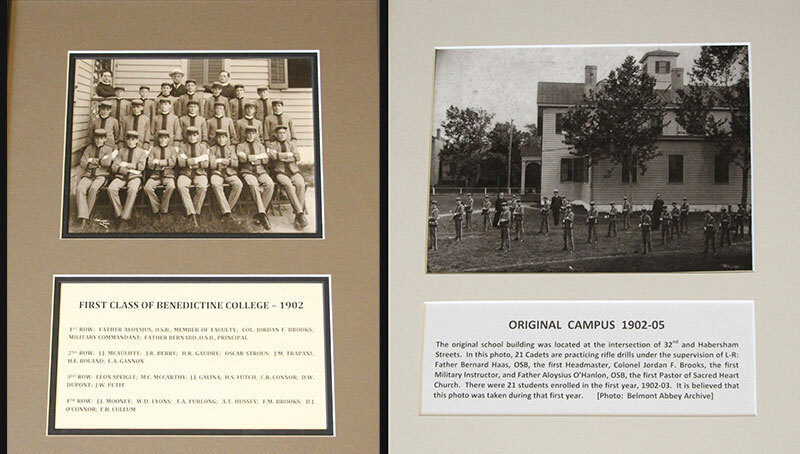 Colonel Jordan F. Brooks was the first military commandant for Benedictine College serving from 1902 until 1913. He was responsible for teaching the cadets military drill, and he began awarding a Gold Medal for Manual of Arms which was determined by a competitive drill. The first medal was won by Cadet D. William DuPont in 1903. Charles Hahne won the medal on display as a freshman in 1907. 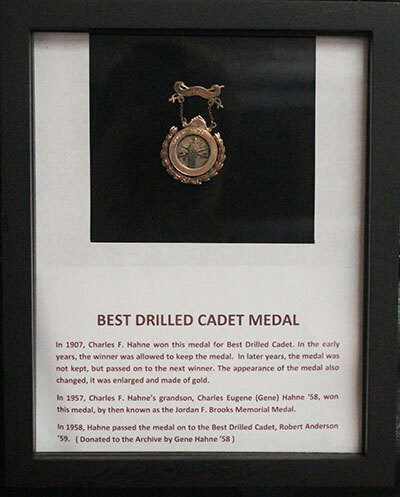 After Col. Jordan retired, the medal was named the Jordan F. Brooks Memorial Medal for Prize Drill. In later years, the medal was passed on from year to year instead of the cadet keeping a medal. Charles’ grandson, Gene Hahne Class of 1957, won the competition. His grandfather gave him his 1907 medal and Gene donated the medal to Benedictine. 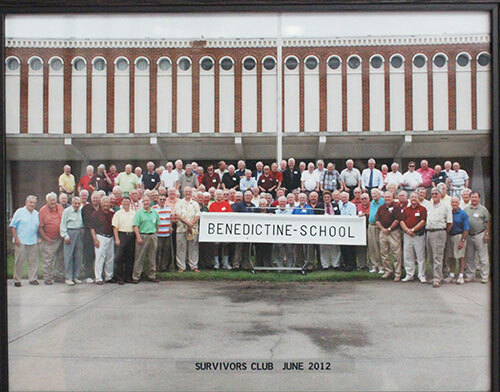 Benedictine Survivors are men who graduated from Benedictine when it was located at Bull and 34th Streets. The school relocated to the current campus in 1963. The photo of the Survivors was taken 1n 2013. They meet every other month to share lunch and reminisce about their days at BC. Half way down Alumni Hall, the first line of the BC Fight Song are painted on the wall. 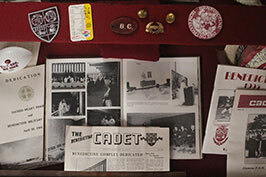 Benedictine graduates immediately identify the words as an important part of their days as BC Cadets. Cadet Eddie Lang wrote these words in 1925, and the song represents BC. As you return to the stairs, you will see the “Roll of Honor”, a painting by Christopher Murphy, Sr. It contains the names of all 206 BC Cadets who served in the military during World War l with the names of the seven cadets who died in military service during the war. Christopher Murphy, Jr. was a member of the BC Class of 1921 and became a well known painter in Savannah and New York. 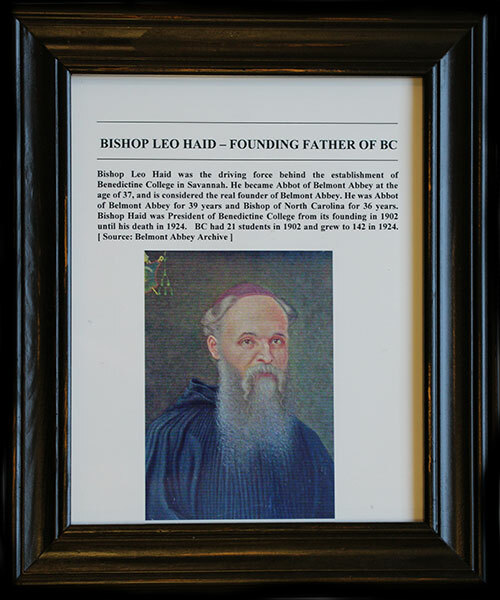 1 The painting of Abbot Leo Haid O.S.B. who is considered the founder of Benedictine. 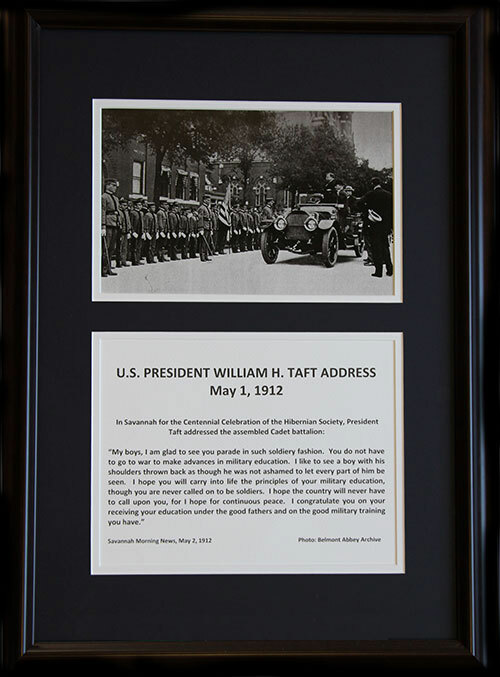 2 A photo of President Howard Taft addressing the cadets on May 1, 1912. 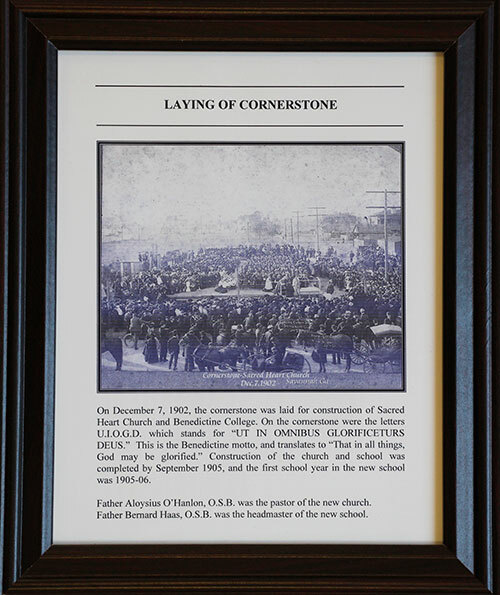 3 A December 7, 1902 photo of Abbot Leo Haid O.S.B. laying the corner stone for the school building on Bull St at 34th St. The school occupied that building from September 1904 until June, 1963. The school has been in the current building on Seawright Drive from September, 1963 until the present. The old bell on display is the one used at the Bull St. School to signify times for classes to begin and end. There is also a ceremonial cannon that has been used for many years at football games and other school events. 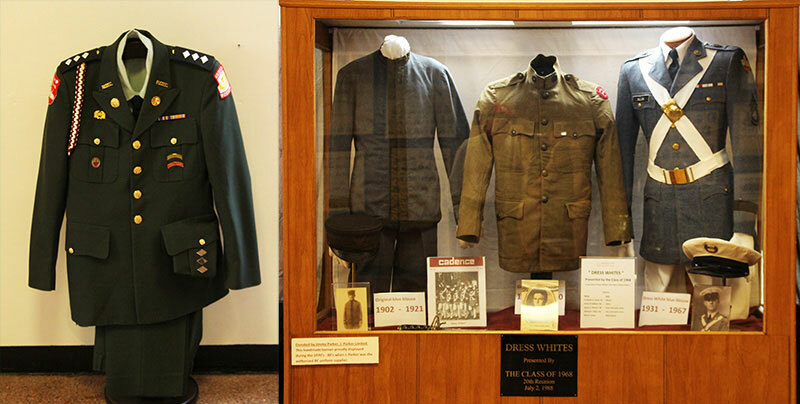 There is a display case presented by the Class of 1968 showing uniforms worn by Benedictine Cadets through the years. The first is the original confederate gray uniforms worn in the early years of the school 1902 to 1921. Next are the green blouse worn during from 1922 to 1930 and the very popular Dress White blue blouse worn from about 1931 through 1967. The Dress white uniform is worn by the Color Guard today. Then there is the US Army green uniform worn from 1968 to present. 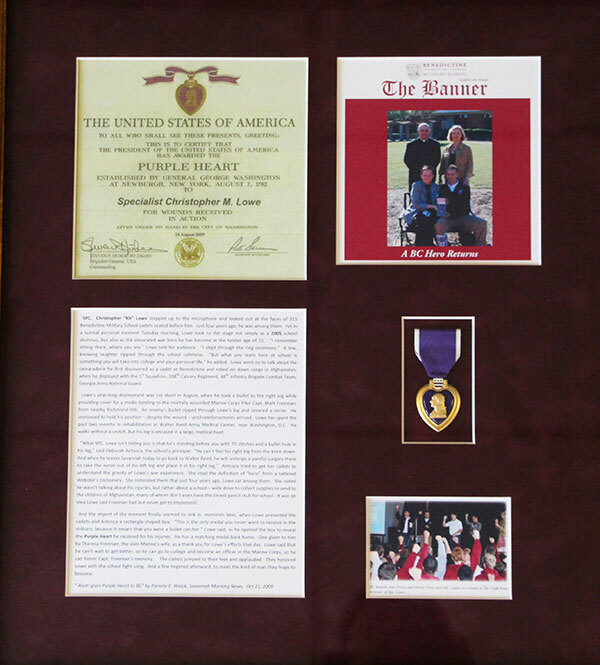 On display is a Purple Heart Medal awarded to Benedictine Graduate Christopher M. Lowe on 14 August, 2009. It was awarded to Lowe due to being wounded in action. It was donated by Chris Lowe. There is a display honoring Lt. General John McLaughlin, United States Marine Corp. who was awarded the Distinguished Service Medal, the Silver Star, the Bronze Star and many other awards. 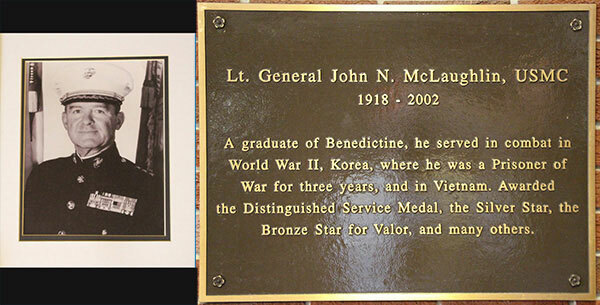 General McLaughlin was a 1936 graduate of Benedictine. 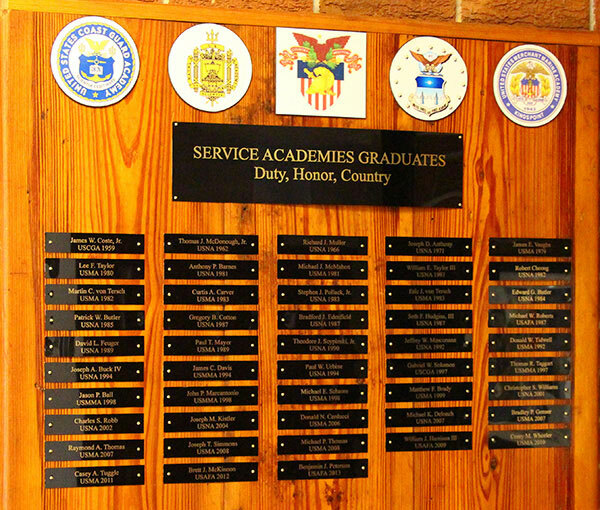 There is a plaque listing the names of Benedictine graduates who also graduated from one of the five United States Military Academies. John Manson Owens, III graduated from Benedictine in 1961; and later served his country, rising to the rank of Lieutenant Colonel in the United States Army. Upon retirement, Owens became the Senior Army Instructor at Benedictine Military School in 1986. Colonel Owens, or “Colonel,” proceeded to lead the BC Corps of Cadets in earning the Gold Star, Honor Unit with Distinction, which signifies the top 10% of all the nations’ JRTOC units. Amazingly, the BC Corps of Cadets never again lost the Gold Star under Owens’ leadership. 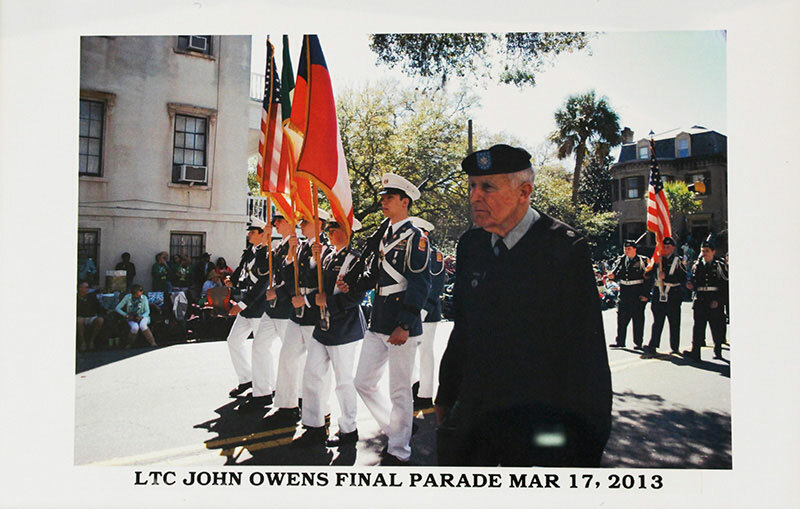 Colonel Owens is also well known for his involvement in with the American Cancer Society’s Relay for Life. He was responsible for bringing it to the BC Campus and growing the event to what it is today. Colonel Owens retired from Benedictine in 2013 and remains one of the best known and endeared graduates of BC. 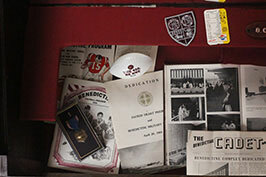 The Benedictine Alumni Association hopes you have enjoyed the tour of Alumni Hall, and hopes you have a better understanding of the rich tradition of Benedictine. Please feel free to linger in Alumni Hall and examine more of the great traditions that have molded many of Savannah’s men.